Evacuees walk through makeshift homes in Balo-i township, Lanao del Norte province after fleeing the besieged city of Marawi (Oct. 17, 2017). A continuing displacement crisis and growing discontent with martial law risk creating yet another conflict. The surprisingly protracted and intense urban war that erupted between government forces and Islamist rebels in the southern Philippines in May 2017 has created a displacement crisis in the area. After five months of armed clashes and air strikes, the Islamic City of Marawi (more commonly known simply as Marawi) was practically turned into a ghost town; more than 600,000 people sought refuge in neighboring cities. From late 2017 on, people have slowly started returning to Marawi, but at least 50,000 are still internally displaced. The small township of Saguiran in the outskirts of Marawi has a population of 3,244. Its evacuation center, as of mid-February 2018, was still hosting 187 displaced families, totaling more than 1,000 people. Many of them are women and children, including infants. Noraimah M. Moti, a volunteer in the evacuation center since the beginning, says that previously there were almost twice as many evacuees. The center sometimes receives supplies from government agencies or NGOs, but they never know when the next shipment will arrive. “What we lack most are diapers, milk and other things for infants,” sais Moti, while surrounded by inhabitants of the center. The remaining families all share one basic condition: Their homes are in the so-called Ground Zero, which remains closed to the public. Living on the cement floor under the rusty tin roof of what used to be a gym court, the families’ makeshift homes are constructed from plastic, cardboard, cloth, and plywood pieces, separating their small spaces from one another. Some have set up sari-sari (convenience) stores in an attempt to generate income, but potential customers naturally do not have much money to spend after having lived like this for now nine months. “We have no news of when we can return. We heard from some civilians who managed to enter Ground Zero that our house is still standing, but everything has been looted,” says Aisah Pandariga. She believes both Maute rebels and military soldiers were responsible for looting the home that has been in her family for generations. Military airstrikes have transformed what was once the pride of Muslim Mindanao — the historic center of Marawi — into rubble. The military says they are clearing the area of unexploded devices, preparing for reconstruction, but few people know what goes on inside Ground Zero and the official information coming out is scarce. On January 30, President Rodrigo Duterte inaugurated the construction of a second military camp inside Marawi, which infuriated local Maranaos, the Muslim tribe that constitutes the majority population in the area. There are three main reasons for the anger: The camp construction will cause further displacement; it will mean allocating money for military structures rather than rebuilding homes; and it will expand the military presence in Marawi – already home to the controversial Camp Ranao – and thus enhance the feeling that not only are Maranaos denied their decades-long claim for autonomy, they are now practically under occupation. The entire island of Mindanao, with a population of around 20 million, is still under martial law, declared in the early days of the Marawi siege and recently prolonged until the end of 2018. In the meantime, resentment against the government’s handling of the crisis might get out of control. That is the concern expressed among Muslims as well as Christians in Marawi and the neighboring Christian-dominated Iligan City. Since the beginning of the Marawi siege, RWCAC has participated in the Mindanao Humanitarian Action Network (MIHAND) program for distributing relief to displaced persons. RWCAC also set up their own program providing trauma counselling for adults and children in the evacuation centers of Iligan, of which four out of eight are still operating. However, the city government plans to phase out the evacuation centers by February 28, despite the fact that only Ground Zero residents are left, and they have no place to go. Moumina Sheryne L. Domadalug, a young Maranao lawyer based in Iligan City, is also concerned. “Setting up another military camp in Marawi is dangerous. The government has to be very cautious, or our maratabat will force a reaction,” she says, referring to the Maranao concept of honor. Though she knows people from her own generation who have joined the Maute group, she finds the claims that Maute had wide local support doubtful. She does, however, fear that the current situation might cause radicalization. “We know very well what military camps in a civilian area means: The presence of soldiers, predominantly male, and in Marawi their contact will be primarily with women, who in Maranao culture are the ones working in stores and with laundry,” Domadalug says. The lawyer says that ignorance about Maranao culture from the Christian-dominated and Manila-centered Philippine public has fueled many myths about the Islamic City of Marawi in general and the Marawi crisis in particular. One sensationalized example relates to the underground tunnel discovered by the military when driving rebels out from the historic city center. The tunnels sparked headlines such as “Tunnels reveal terrorists’ ratlike tactics” (from the Philippine Inquirer). The existence of tunnels, which also held weapons, food, valuables, and money, was taken as proof that the Maute attempt to take over Marawi had been planned for years under local protection. Though the Maute group certainly made use of the tunnels, they were never meant for them, according to Domadalug. “It’s not something to be proud of, because it speaks also of the fault of our people, but those tunnels were built generations ago to be used in rido, which is why people keep weapons there,” she says. Rido is a Maranao tradition of blood feuds among clans. 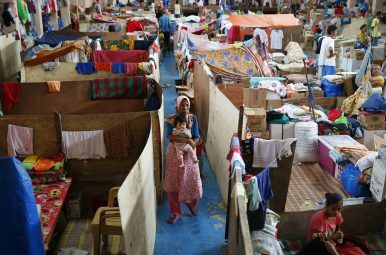 In the evacuation centers, the sentiment so far is predominantly despair, especially among those in Iligan City who might soon have to relocate to yet another cardboard box home on the outskirts of Marawi. Omar Dimaporo is the leader of the cluster of displaced Maranaos living in Buru-un Fisheries evacuation center in Iligan City. He got trapped for ten days in what is now Ground Zero, because he went home to get some things after having escorted his wife and children out of the city. He ended up fleeing by foot and empty-handed. He is worried that there are still armed rebels in Marawi and does not believe the promises of either the military or the national or local government. “My dream is for a new Marawi with peace, work, and shelter,” Dimaporo says. “With the help of Allah, we can have that.” Asked who besides Allah might be able to assist, he is quiet for a while. Nina Trige Andersen is a historian and freelance journalist.